There are many highly secretive projects being worked on at Lucasfilm these days that fans are dying to know more about. One of those is the video game that the Electronic Arts studio Visceral is working on. 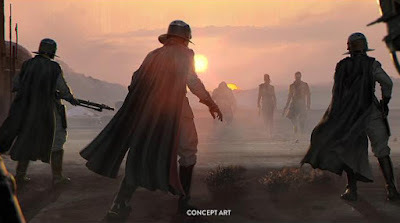 The game was part of the original announcement that EA would be making Star Wars games, but since then, with the exception of learning some members of the creative team and a quick video preview at E3 2016, very little has been said about the game. Yesterday, our friends over at MakingStarWars.net reported the first plot details anybody has heard about the game. Now, they're back with more details about what fans can expect from the game's story. As always, there is a chance this may not be true, but if you are trying to avoid all Star Wars spoilers stop reading now. This is your SPOILER ALERT! In case you missed it, yesterday's report revealed that game would center around "Dodger" (that's his codename), an Alderaanian survivor and Imperial draft dodger who takes a job from Jabba the Hutt so he can pay off corrupt Imperial officials to take his name off the list of Alderaan survivors. The job from Jabba would lead to him discovering a weapon that would "force him to confront his past." The Rang Clan sets up a mining facility among the ruins of Alderaan. This sounds like an great concept from a Star Wars story. The idea that the Empire would somehow be able to weaponize the ruins of Alderaan is a very dark concept. It will be fascinating to see how an Alderaan native like "Dodger", or even Princess Leia for that matter, would react to something like this. Hopefully the game lives up to this great concept.